The Gulf of Morbihan on Brittany’s south coast is a good choice of holiday destination, with many sights and activities, including a variety of walking options, but it’s not easy to know where to go with such a jumble of ragged peninsulas and land facing all points of the compass. Here are some suggestions. If you enjoy coastal walking without steep gradients, the GR34 in this area is relatively level for linear walks, whilst there are also interesting circuits taking in important sites and a choice of island paths. Some parts of the coast are built up and not especially attractive but all points provide differing views over the gulf, almost an inland sea strewn with hundreds of small islands and enhanced by frequent boat traffic and rich wildlife. The Pointe d’Arradon offers an easy stroll with great views, or walk east from Port Blanc along the Anse de Moustran, looking across to the Ile aux Moines. If you are interested in a bird-watching foray, go to the southern arm of the Gulf and walk the coast path between St-Colombier and Sarzeau, or stay nearer Vannes and explore the marshes around Séné which are part of a well-established nature reserve. For a good picnic spot and a total 10km out and back trip, start from Arzon and follow the GR34 west all the way to the Pointe de Bilgroix, a truly impressive view-point where the ocean meets the gulf waters. For circuits of historical interest, it would be hard to beat the end of the Locmariquer peninsula, walking from the town down to the Pointe de Kerpenhir, with a visit (paying) to the famous Neolithic tumulus site en route and continuing round the headland and along the beach to the Dolmen des Pierres Plates, where you can go right inside (open access) this remarkable burial site. Another recommended circuit for a day’s walk (about 16kms) would be at St-Gildas-du-Rhuys, combined with a visit to the beautifully restored abbey, one of the finest examples of Romanesque architecture in Brittany. For a shorter outing, visit the Petit Mont monument (pictured) near Port Crouesty and then walk right around its headland with a great perspective over the ocean. 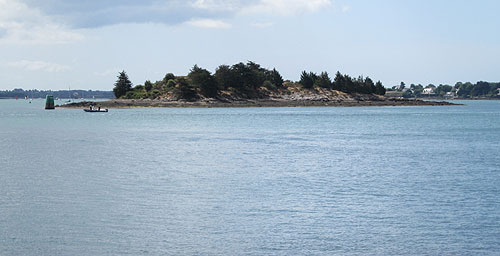 The Ile aux Moines and the Ile d’Arz are two islands easily accessible by boat from the Gare Maritime in Vannes or other points along the north coast of the gulf like Port Blanc. Both islands make excellent day trip locations, with good footpaths and plenty of refreshment outlets. The Ile aux Moines has more than 20kms of marked routes around its shape of a cross, with a variety of Neolithic monuments along the way. The Ile d’Arz nearby has a 16km circuit right around the coast with varied scenery, a tide-mill, some great beaches and the marais salants (salt marshes) once important for the island’s economy. And whilst it’s not a walk, don’t leave the area without taking a boat from Larmor Baden to the tiny island of Gavrinis for a sensational Neolithic art show!